As The Cave opens, you'll find a strange collection of seven explorers anxious to enter its maw. These explorers include an adventurer, a hillbilly, a knight, a scientist, a monk, a time traveler, and a creepy pair of twins, and while they may at first seem like a diverse group, they all share something in common and to find out what that something is you'll have to join them on their trip into The Cave. Well, not all of them, at least not at first. Your first task in the game is to pick which three of the seven you'll take into The Cave. While each one has a unique special ability, which abilities will be available to you won't make the game easier or harder, just different, so you're fine just picking the three that look the most interesting to you and starting your adventure. And an adventure it is, at least in terms of game genres. While the game does have some elements of a puzzle platformer, it's more akin to the classic adventure games of old. The puzzles are the kind that require using one object with another and often solving what appears to be a simple problem will require a number of elaborate steps. As an example, albeit a deliberately vague one to avoid any spoilers, you might find a tape recorder and have an idea what to use it for, but it's missing batteries. After figuring out how to get the batteries and putting them in the recorder, you'll find that you'll need to charge the batteries, which of course is another puzzle itself. The puzzles range from the simple and straightforward to the slightly devious, but none are obscure or unfair, so with a little persistence you'll be able to get through the game. The puzzles actually get a bit easier the farther you get into the game, not so much because they're actually easier, but because some mechanics are used repeatedly throughout the game. Once you solve a puzzle that requires you to make use of dynamite, you'll recognize when and where you'll need to use dynamite later in the game. The puzzles will often require you to coordinate the activities of more than one of your characters. You can only control one character at a time, but you can switch between them instantly by using the D-pad. 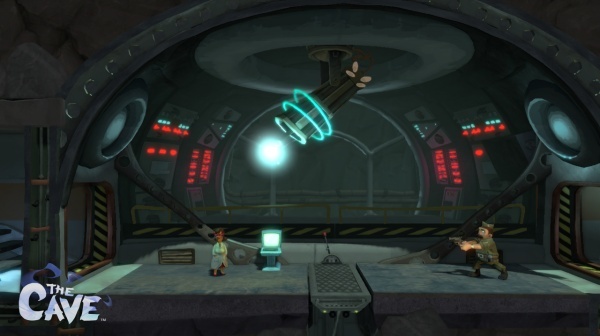 A few of the "co-op" puzzles are timing-based, but for the most part they just require that you have a couple of the characters in the right places at the right time and with the right objects. There's some natural traversing back and forth with the different characters over an area, but overall it's not bad and the game will collect your other characters together for you as you transition from one area to the next. The Cave is divided into six major areas with smaller areas at the start and end. Three of the major areas are the same no matter which characters you select, but the other three will be determined by those characters. In fact, it would be impossible to enter those areas without the appropriate character's special ability, such as the hillbilly's ability to hold his breath underwater or the scientist's ability to hack terminals. 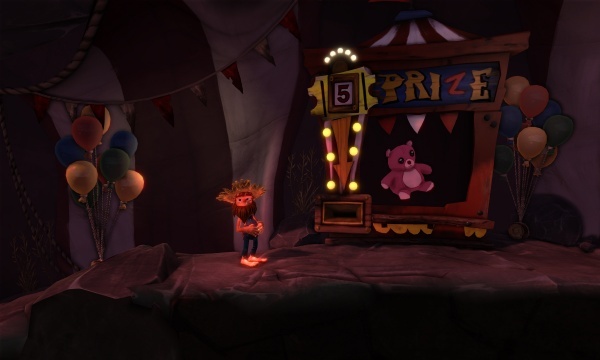 Each character-themed level is inspired by an incident in that character's past, but revealing anything more than that will only serve to spoil some of the charm and mystery of The Cave. Uncovering the characters' backstories by playing through their areas and by discovering the "cave paintings" that reveal comic book panel style stories about them was one of the things that I enjoyed the most about the game. Don't expect a deep narrative from the game, though, the characters' stories are more like vignettes than they are full-fledged stories and the way that they are related is left open-ended by the game. If you like your stories all wrapped up in a neat little bow when all is said and done you'll be disappointed, but if you don't mind them being left intentionally vague and open to interpretation you'll leave The Cave happy enough. The first time through the game will take you five to six hours to complete, but the motivation is there to play through the game again with a different set of characters to learn their stories as well. Unfortunately, the second time through you'll be replaying three of the game's areas and will need to go through the motions of completing previously solved puzzles as quickly as possible so that you can move on to something new. After two play-throughs you'll be left with one remaining character, so to learn that character's story you'll need to replay five areas that you've seen before. It would have been nice if the game would have short-circuited things on subsequent play-throughs so that you could get more story and less repetition, especially since it gives you seven instead of nine characters. Odd design decisions aside, I enjoyed my time in The Cave. I liked the animated art style, the dark humor, and the running commentary and narration provided by the disembodied voice of The Cave itself. I can tell that the game won't appeal to everyone, but if you enjoy clever puzzles and a sense of humor that skews dark I think you'll enjoy the game as much as I did. Final Rating: 85%. Adventure game fans should take the time to do a little spelunking in The Cave.